These were bought and consumed in College Station, Texas at a bar called Zapato’s, but you can make them at home for a fun summer party centerpiece. * Buy 1 metal trash can lid. * Wash the lid thoroughly, then wash it again. Not that the first washing wouldn’t do the trick, but it just skeeves me out. * If the lid has a fixed handle, you’ll want to hammer that badboy flat, so your lid will lay securely on the table when you get ready to serve. * Arrange nacho chips, meat, cheezez, and optional jalapenos. * Place in oven at, oh, 300 degrees for 10-15 minutes. * Carefully remove lid from oven and let cool for a few minutes. * Garnish with sour cream, chopped tomatoes and possibly more optional jalapenos. * Place in middle of picnic table, with plenty of ice-cold adult beverages and juice boxes. * Let the good times roll. Only bringing you the best, mah babies! And there’s enough that I might even share. It is an odd sensation to see food in a trash can lid, but then it turns into a party! It’s a fun way to feed a crowd! BAM! They’re gonna love it. So fun! So fun! Glad you liked it. Pin! OMG, so funny but so perfect for a party! What a wonderful party idea! we have a party coming up so I’m going to make one to thank for the wonderful idea. Happy to help. Have a great party! Very cute idea and it looks yummy! How could anyone hate nachos?! Oh man. Eat the whole thing?! I’d rather spend the dough on ice cream! But these were good. Yum. Yikes this is big!! I love nachos and it looks like heaven! I’m visiting today from DIY Mom. I hope you get the chance to visit my blog, linkup and leave a comment, too! I’d love to see their faces if you served them these. LOL! Thanks for coming over to http://www.whoneedsacape.com to link up on Super Sunday! Can’t wait to see what you bring us next week! Wouldn’t be nice if we could stop what we’re doing and have a nacho party…right now! Great idea for fun times. It was parchment paper, so the lid could be filled up! 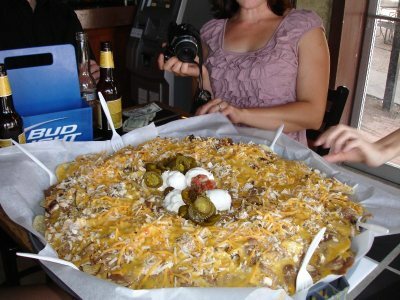 That is the biggest, nacho platter we have ever seen! What a great idea for a party. So glad you linked up with us. What a clever and fun idea! 🙂 I’ve pinned this to my party planning board because I think it’d be great for my son’s birthday in a few years! Thank you so much for linking up with me this week at Tasty Tuesdays! I’ve pinned this & shared it with my followers! Please be sure to stop back by the party and check out some of the other links! Thank you for the share! And it IS a great idea for any party. When that giant lid comes out…BAM! instant fun. 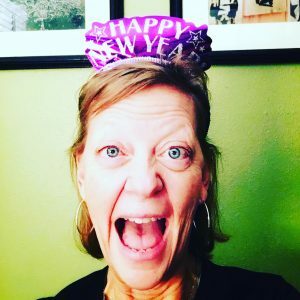 Congratulations…this post was featured on Create It Thursday #8! Thanks so much for linking up such a fabulous idea last week! Lol! Thanks for the invite. This would be the perfect midnight snack for hubby and me! Bwahahahaha!